I must say I’m pretty happy with my workplace as it has good food around the area. 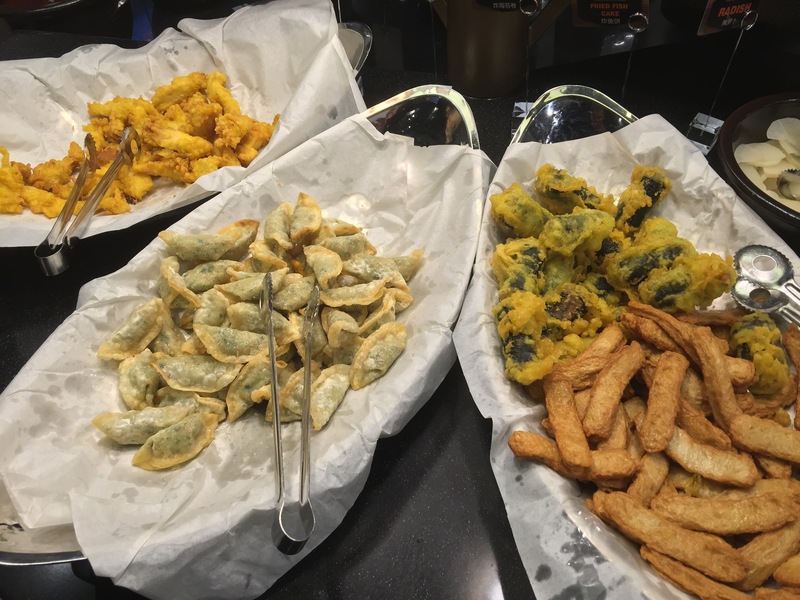 Chibing Korean Restaurant offers a wide variety of dishes, from appetizers, to chimaek sets, stews, pancakes, all the way to bingsu! It does sound like a perfect 3 course dinner. Chibing is ideal for big groups as their portions are pretty sizeable and can feed at least 4 people per portion (e.g. the stir fried chicken set we had). Top up with some side dishes and bingsu and you’ll be filled up by the end of your meal. You can head there for a light lunch (if you don’t want to head back to office with food coma to come), or dinner, where you can enjoy the full ‘3-course’ meal. Their Spicy Stir-Fried Chicken comes adorned with lots of vegetables, so you will not feel guilty. Cabbages, peppers, tomatoes, carrots, and spring onions are lined up side by side with the chicken right in the centre. 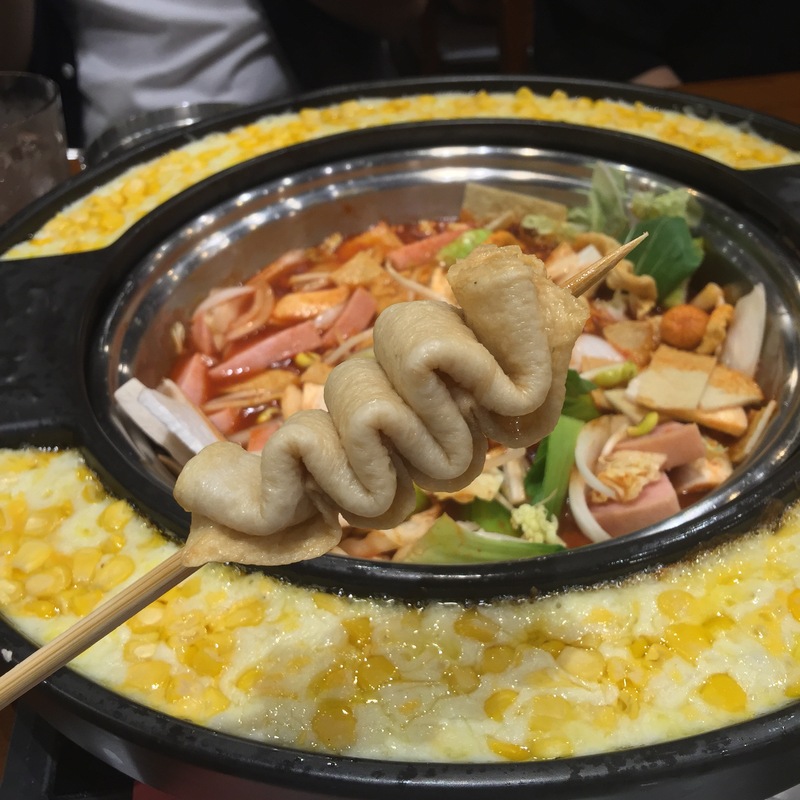 The pot is heated up to a point where the staff will help you with the frying of the dish. When everything is mixed well, you can start eating. YES you can add rice when you have cleared most of the chicken dish and YES you can definitely request for cheese to be added. Mix everything together and you’ve got a well seasoned rice with gooey bits of cheese hiding inside. Chibing does not only have a la carte dishes to offer, but they have their Unlimited BBQ promotion which is about S$20++ for adults and S$10++ for children. For that price you will get unlimited pork belly (pretty thick slices as well), free flow of side dishes, soy bean paste stew (Doenjang-jjigae), rice, and steamed egg. A downside of this promotion is that you have to pay an extra $2 for lettuce and $3 for oyster mushrooms. 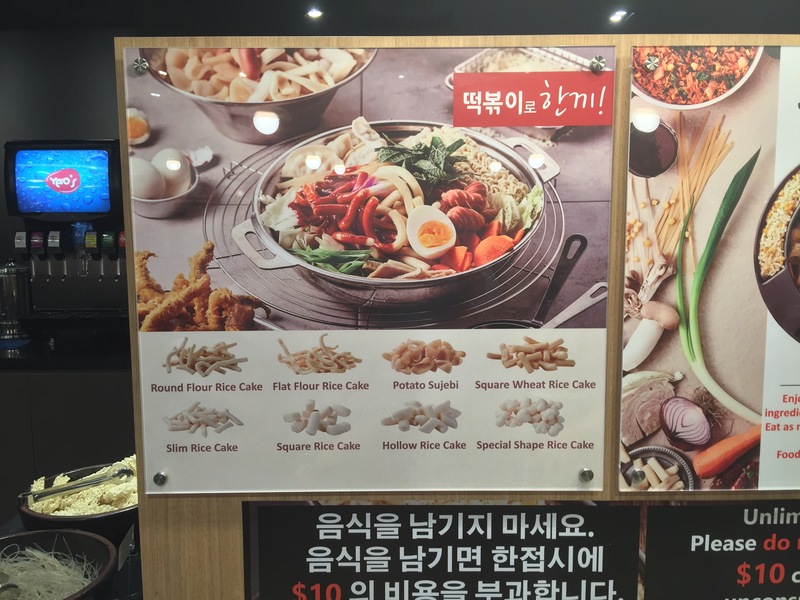 ​But I’m sure K-BBQ lovers go there for mainly their meat, and Kimchi is already a free-flow side of vegetables so I don’t think it will be an issue! The lady boss also taught as to place the kimchi towards the end of the grill, where the fat from the pork belly will accumulate and cook the kimchi, giving it added flavour. 3 of us shared 11 strips of pork belly and by the end of the meal we were thoroughly satisfied. 90 minutes for lunch? Let’s go! Enough talk and let’s go straight to the food. 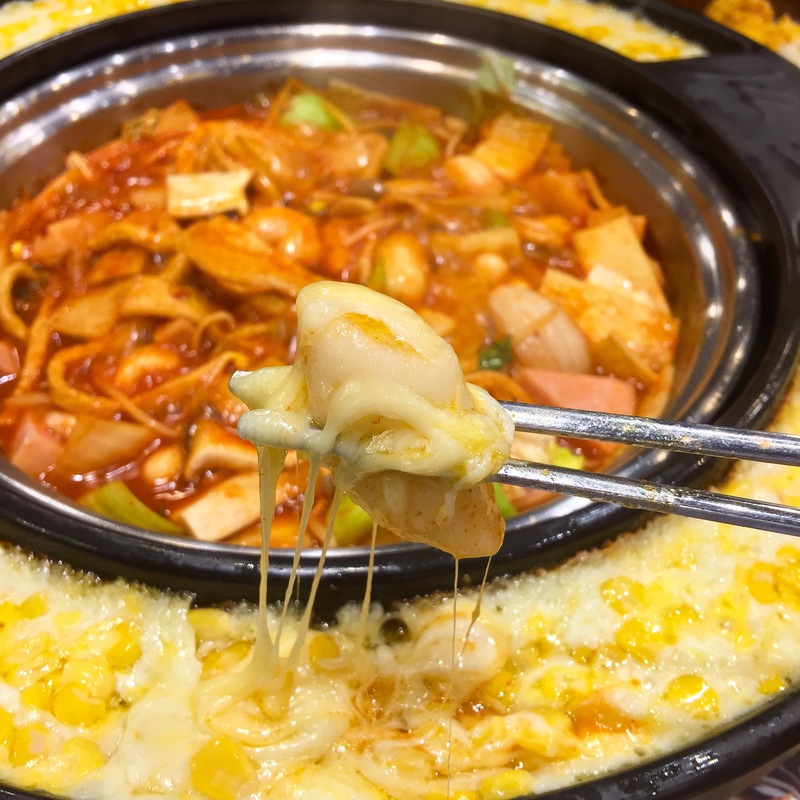 If you love Korean spicy rice cakes (tteokbokki) and hotpots, why not combine them into one? Dookki Restaurant is the place to go! Situated at the basement of Suntec City, it is a few units away from Ya Kun so you’ll not miss it! Dookki restaurant is quite popular so you have to be prepared to wait for your table. Most importantly, make sure EVERYONE from your group is there and ready to enter the restaurant. Rest assured, the staff is really efficient in making sure you have a table and are seated comfortably. Once you’re seated at your table, and when the waiters/waitresses have taught you how to handle the hotpot, off you go to the buffet section! They have 8 varieties of rice cakes, and they come in different shapes, lengths and sizes! My personal favourite? The sweet potato rice cake. Keep your eyes peeled for a purple rice cake! When you’re done choosing the rice cakes, get yourself some sausages, seafood, spam, and vegetables (this is to make you feel less guilty when you’re gobbling down all the processed meat). Please take the mung bean sprouts as they go really well with the sauce and adds a crunchy texture to the dish. 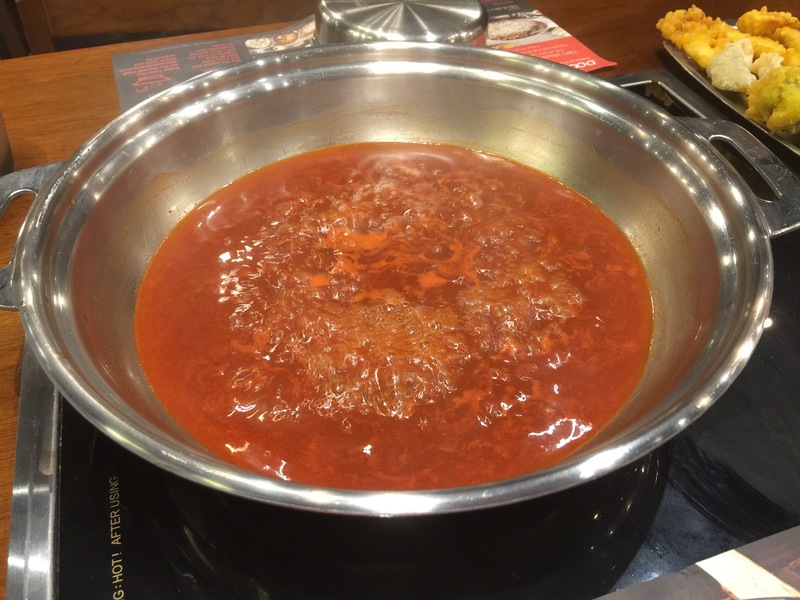 Of course, what’s tteokbokki without its sauce? 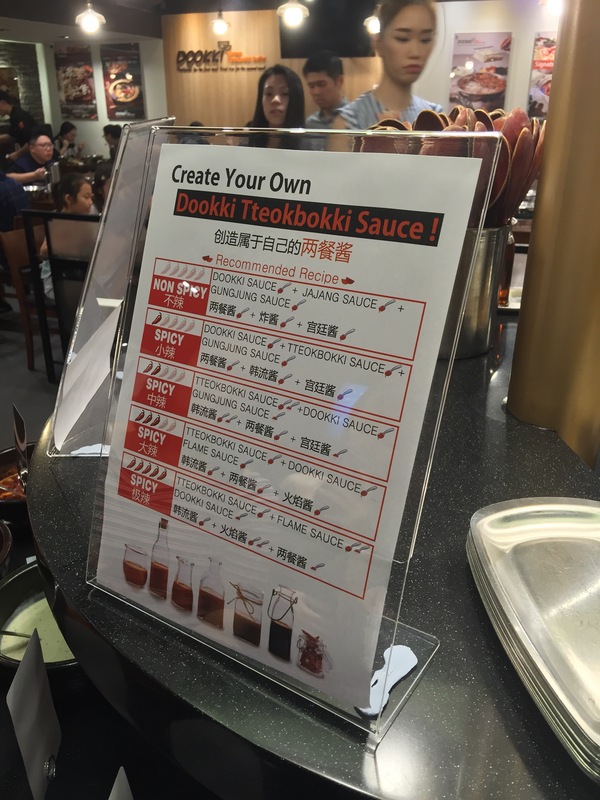 Concoct your spicy sauce with the 5 recipes displayed at the sauce corner. OR, if you’re into spicy foods like me, go all out (add more of the flame sauce). Just behind the sauce corner are dishes of fried food. These are all meant to be put into the pot when the sauce is done so don’t forget it! My favourite would be the fried ‘kimbap’. Instead of ‘bap’ or rice, they wrap noodles with seaweed, dip it in batter and deep-fry it. An absolute joy. 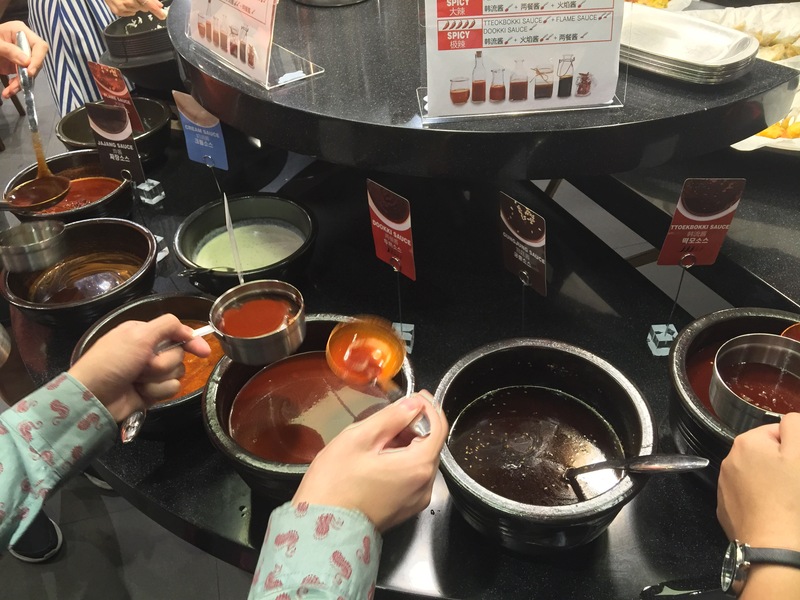 Once your sauce is ready, add the stock along with the sauce and this is what you should get, as shown above. Let it bubble before adding all your ingredients in. Give it a good mix and you should get what I got below. The sauce will definitely thicken so it is up to you to pour in a little bit more stock if you find it too thick for you. Oh, before I forget, they serve “eomuk”, or commonly known as fishcakes on skewers! These are pretty reminiscent of Korean dramas – how they savour every single stick and wipe it clean. Lastly, top up approximately $10 for a cheese ring if you’re an absolute cheese fan. I was impressed at first but I realized the ring was not attached to a heat source, thus the cheese hardened when it cooled down. So the trick is to eat it all up (i.e. wrap it in rice cakes or anything) before it hardens! It is totally fine if you skip this order. 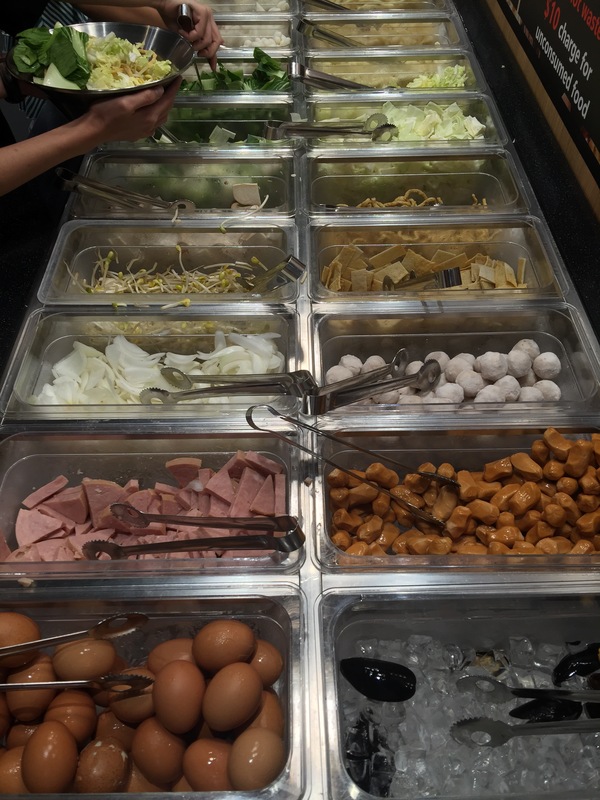 At $18.80++ per person, I don’t see why you shouldn’t go for this buffet!